Lots of fun things happened this past week including a couple of "holidays". There was Take Your Dog to Work Day, Dog Party Day and the first official day of summer. Did you celebrate any of these days? I work from home, so Shiner helped me out with some very important treat taste testing and other fun things which we'll be talking about later on next week. 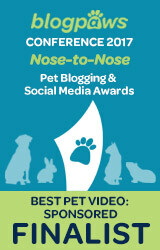 I read about Planning for Your Pets In Case of Arrest at Rumpy's blog. Now, this is something I never really thought of before but is definitely something to consider. Especially if you partake in illegal activities. Now, I'll admit guys that I went to jail one time many years ago for not paying a simple traffic ticket I had forgotten about. Pretty embarrassing to admit but it happens and jail is not fun. I was supposed to go to work and walk the dogs that morning. Fortunately, I was able to call my boss and tell her and she was able to care for the dogs. So now that it's summer time, you may be looking for some fun summer activities that your dog can enjoy. 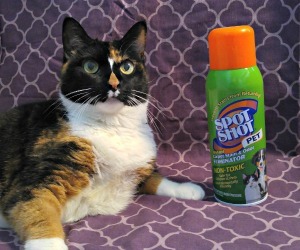 Paws It On shared a great list of great Pet Summer Activities. Speaking of summer, you've also got to be careful and watch out for all those dangers that may lurking under the sun. I am an Austin Pet Health Examiner and I wrote an article that was published last week called 10 Tips to keep your dog happy and healthy during summer. Have you ever heard of Pet Flipping? It's a new scam where people claim found dogs as their own and then sell them to others. You can read all about it at A Tonk's Tail. Vote for Simba! 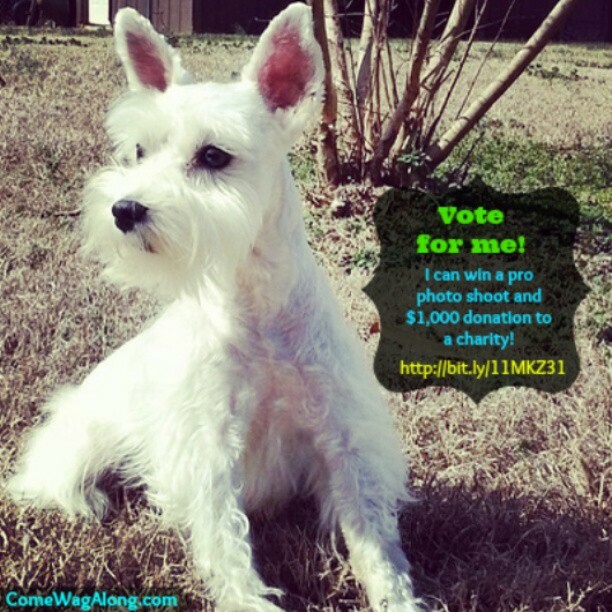 Simba from Come Wag Along is in a photo contest and he's just so cute, he really deserves to win! ;) You can vote for Simba here! 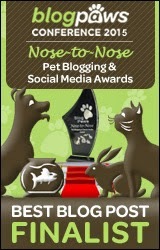 Special thanks to the crew at All Things Collie for passing on the Versatile Blogger award to Pawsitively Pets - I appreciate it! If you don't know them, stop by and say hello. They are a bunch of gorgeous Collies! You may have noticed that I took down my "Awards" page recently, but it's not because I don't accept or appreciate awards anymore. I am finding it hard to keep it updated! So that's why you don't see it up there anymore. Stay tuned this week for some exciting and fun things! Oh well.. I don't mind a little rain every now and then... it cools things down here! LOL in case you get arrested.....yikes. 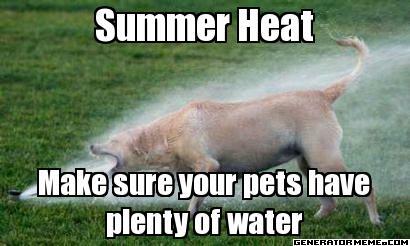 Stay cool and stay hydrated is just what we should all be doing....hear, hear. Have a super Saturday. Really? I wonder if they were allowed the chance for someone to come and get the dog first? I got arrested in January 2013 with my dog. I was not given any option or choice. They just did what they wanted. I was asking constantly the whole time "Where is my dog, what have you done with him ?" They didn't tell me what they had done with him until 8 hours later. They released my dog to the girl who was driving us. She went and gave my dog to her friend. Then he was SOLD to another person. All without my knowledge or permission. She could of just took him to my Dad's. I mean she showed up at my Dad's soon after, to pick up her stuff I was letting her store there. I am still trying to get my dog back 10 months later. It's frustrating. I know where he is and who has him. I am now taking them to court. The police would not do anything. Know that if you are arrested you DO have rights concerning your property (especially a living being). What Police are SUPPOSED to do is call someone you agree to, to have them pick up your dog. Or have the dog go to a kennel under an agreement that you will pay boarding fees for the time your dog is there. Doesn't mean you always get that choice. I didn't. And now I am having to go through a bunch of B.S. to get him back. Well, good luck to you. Sounds like a not fun ordeal... I'd be upset too. Oh thank you Easy! Stay dry! Simba is very very cute. And those were some good posts. Well done. Hope all of you have a great weekend. We don't make it over this way nearly as much as we'd like! We'll have to fix that because we love reading your bloggie! No problem kitties, I understand :) I thought people might do something like that but hadn't heard any news stories on it yet. Very sad indeed! This is my first summer with a pet. Thanks for the great summer time tips! Oh sure Jane! And good luck! I know the two of you are going to have a great time! love the updates! I am proud to say I read nearly every post you mentioned! Yay Caren! Thanks for reading! Lots of good advice. Thanks for sharing! I love that nice drink of water!!! Great roundup of goodies! Yo! I'm more likely to be arrested than my peeps. Heh heh. If anybody axs, you don't know me, OK. Concats on the award. Believe it or not, that looks like something Waffles Kitty would enjoy! ...the photo of the dog and the sprinkler that is! They throw people in jail for not paying a traffic ticket where you live. Yikes!